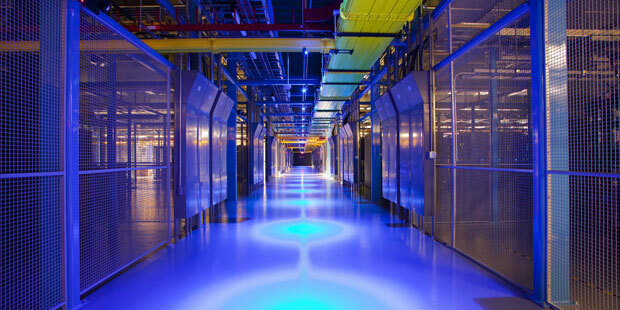 Equinix is one the regions primary commerce and banking data centres congregating the majority of Asia Pacific telecommunications carriers and service providers. While Equinix commitment to Australian data centres introduces a size and service level on an industrial scale, they also enable us to directly peer directly with all our local, New Zealand and US upstream and peering providers all with points of presence in these same facilities. Our networking and server infrastructures are distributed between Equinix, Mascot SY1 and SY3 facilities on an active / active configuration with all connectivity between our direct upstream carriers and transit providers using the Border Gateway Protocol to manage the complex routing, security and scalability requirements of an ISP. Wholesalers and larger corporate customers looking for alternatives to our internet transit can connect directly via xConnect or alternately via our MetroVoice product. We use Juniper MX in the core network with two levels of Juniper EX switches used to separate our external subscribers from the LAN. Dell’s PowerEdge is our server equipment of choice because we really understand and like them, from setup and installation but just as importantly their warranty, support and not to be left out their iDRAC remote access interface. And if all else fails we can still reach all the above, the Junipers, all the Dells through our OpenGear remote management console — even during system or network outage. On the application layers, while we make extensive use of VMware we do not virtualise either our calling servers, or the monitoring systems with both platforms therefore deployed on ‘bare metal’ machinery. For ease of management and physical separation of processing and data we’ve used multiple tiers of NAS for all data and storage. xConnect costs: We don’t charge for xConnects but require resellers or partners to pay their own xConnect charges to either or one of our two facilities. AS Numbers: Reseller can use their public AS or be assigned a private AS by us. Layer 3 Multi-Access: This favours Layer 3 Service Providers selling and managing MPLS VPN or some other VPN technologies. 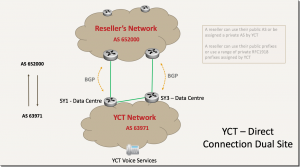 YCT provides a single VLAN and subnet over which we route an agreed private range to the Service Provider. The Service Provider can then subnet the private address range for customers as required. The service provider divides and maintains the address range as required. Once the Service Provider has provisioned the service with in their network the final step is to add the new customers via the customer portal enabling either Registration or Peering. YCT is not involved in this process. Layer 2 Ethernet: The service is provided as individual VLANs between each of the Service Providers customers, as such there is no IP addressing. 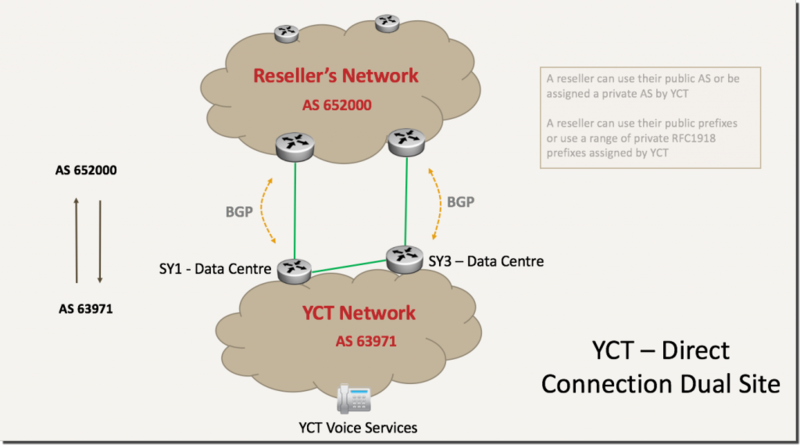 The assumption is that YCT will provision individual subnets and VLANs per customer. As with the Layer 3 above the final step is to add new customers onto the customer portal. In answer to the question of why we don’t offer Service Level Agreements (SLA). While some tier-one carriers offer limited SLAs to business customers on a monthly service fee, the agreements rarely provide the customer with the assurance originally intended and behind the scenes between carriers SLA’s are rarely if ever part of a standard form carrier interconnect agreement. To explain why don’t provide SLA it’s useful to view the component parts of a Telco. UpStream Carriers: Like all Telco’s only a smaller number of calls are classified as ‘on-net’ usually between you and a caller in your company or another customer on our network. The majority of calls are received from, or routed to, upstream carriers. If that carrier becomes unresponsive at the second you attempt the call we will instantly reroute that call to a second, or third carrier when we detect an issue. In our language we refer to this as the “least cost route’ (or LCR) which is an algorithm that determines which route to send the call to (based on quality and cost). Between us and our upstream carrier partners carriers don’t include SLA’s as there are simply too many variables outside of either parties control. Cables are dug up, electricity disrupted, and tragically sometimes even people deliberately planes fly into buildings. Our physical servers: If you’ve read the top part of this page you’ll understand the investment made into building and maintaining our physical infrastructures. The end result is those systems rarely if ever fail, a state referred to as “high availability”. Collectively the uptime on on our infrastructures is better than 99.99% or less than 1 hour per year. From time to time we will take a router or server offline to apply a vendor software update, or replace system a hard disk or power supply our notified by our monitoring systems. But even then this rarely if ever takes our entire ecosystem system offline and we will always notified those as planned outages pushing our actually availability out to 99.999% (five nines) or less than 10 minutes per year. MetroVoice: Our MetroVoice service is provided on a limited service commitment. While there is a service schedule against this what that means is our commitment to respond to your ticket with sensible responses as it likely cause and our suggested next steps.